The low deployment cost, increasing industrial automation, and importance of regulatory compliance are the key influencing factors of the manufacturing execution system (MES) market. The manufacturing execution system market was valued at USD 7.63 billion in 2015 and is expected to at a CAGR of 13.6% between 2016 and 2022. The base year considered for study is 2015 and the forecast period is between 2016 and 2022. 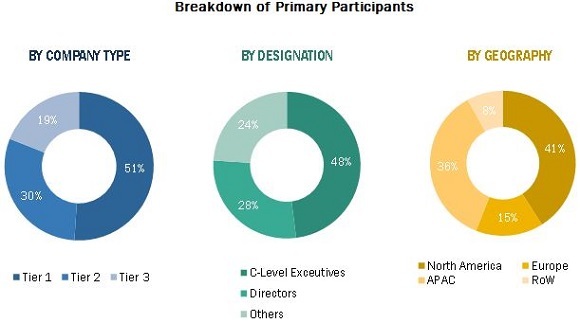 The objective of the report is to provide a detailed analysis of the manufacturing execution system market based on deployment type, offering, process industry, discrete industry, and geography. The report provides detailed information regarding the major factors influencing the growth of the MES market. The report also gives detailed overview of the value chain in the manufacturing execution system market and analyzes the market trends with the Porter's five forces analysis. The MES ecosystem comprises component providers, OEMs, system integrators, software providers, and distributors. The players involved in the development of MES include ABB Ltd. (Switzerland), Honeywell International Inc. (U.S.), Rockwell Automation, Inc. (U.S.), Schneider Electric SE (France), and Siemens AG (Germany) among others as well as associations such as Institute of Electrical and Electronics Engineers (IEEE) and International Society of Automation (ISA). This research report categorizes the manufacturing execution system market on the basis of the deployment type, offering, process industry, discrete industry and geography. Deployment activities comprise installation, activation, adaption, updating, and uninstallation. The deployment and configuration is costly and requires more time with an experience for proper execution. The use of configuration wizards and import techniques by MES reduces the errors during configuration, which ultimately helps in reducing the deployment cost. This facilitates easy configuration process. Configuration wizards are used for advanced applications and bulk import techniques for data upload. Usually, MES are large and installed at initial stage and later the configuration and movement of MES to production area take place. The smooth deployment process takes place from staging to production area with the help of bulk import technique. There is increasing use of control systems such as computers, robots, and technologies for the machines in process as well as discrete industries. The demand for industrial automation is high owing to benefits such as high productivity, flexibility in manufacturing process, quality, data accuracy, and safety of personnel. Integration of solutions such as ERP, SCADA, PLM, and PLC with MES also enhances the efficiency of processing and gives effective output. MES is capable of performing multiple activities and delivers efficiency by checking quality as well as production optimization. It tracks the processes and procedures of manufacturing done with the help of industrial automation. This helps the company to maintain a proper track from its initial phase of raw materials to the end phase of distribution of products to end users. What are new application areas which the MES manufacturers are exploring? The manufacturing execution system market is expected to reach USD 18.22 billion by 2022, at a CAGR of 13.6% between 2016 and 2022. The growth of this market is propelled by low deployment cost, increasing use of industrial automation, adoption of MES owing to growing benefits, and importance of regulatory compliance. The software market is expected to hold a large share of the overall manufacturing execution system market in 2016. The increasing level of automation at industrial plants requires software to save time by monitoring and analyzing the performance data, improving the quality of the production, and reducing production time and waste. The services market is expected to grow at the highest rate between 2016 and 2022 as the major functioning of MES is largely depended on the post-implementation process, which includes software upgradation and updating according to the specific requirement of the customer. The market for the on-premises deployment type accounted for the largest share of the manufacturing execution system market in 2015. The security and control over data and access to the limited number of people is increasing the adoption of on-premises deployment type across industries such as automotive, food and beverages, oil and gas, chemicals, and pharmaceuticals, among others. The market for on-demand and hybrid deployment type is expected to grow at high CAGR between 2016 and 2022. The low cost of deployment, no requirement of capital expenditure, hardware/software maintenance, or tech support as it is provided through a third- party service provider is increasing its adoption among small and medium sized companies. The pharmaceuticals and life sciences industry is expected to dominate the market during the forecast period. The growing cost pressures, regulatory, and safety guidelines as well as increasingly diverse product portfolios have resulted in the high adoption of MES in this industry. The food and beverages industry is expected to grow at the highest rate in the global manufacturing execution system market. The players in the food and beverages industry are majorly focusing on offering technologically advanced and high-quality products, while keeping the production costs to a minimum. Thus, there is a growing demand for manufacturing execution systems in the food and beverages industry. The automotive industry is expected to dominate and grow at the highest rate in the manufacturing execution system market in 2016. The automotive sector is one of the early adopters of manufacturing execution systems to remain competitive in the market. The use of manufacturing execution systems helps the industry to save time during assembling, resulting in increased productivity. North America held the largest share of the manufacturing execution system market during the forecast period. The automation and servicing requirements are shaping the demand for manufacturing execution systems among process and discrete industries in this region. Further, supportive government programs and events and conferences are also driving the growth of the North American market. The market in APAC is expected to grow at the highest rate in the overall manufacturing execution system market during the forecast period. The major driving factors for the growth of the APAC market include the increase in the number of manufacturing plants in various sectors such as automotive, power, and pharmaceuticals where MES is much in demand. Moreover, China and India are considered to be the growth engines for the MES market in APAC. 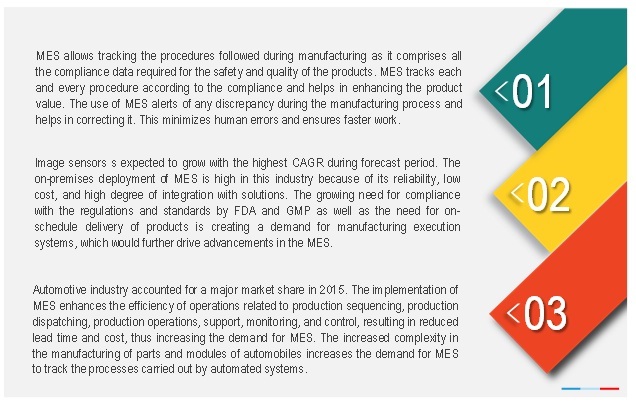 One of the key restraining factors for the manufacturing execution system market are low adoption of MES in small-and medium-size companies and high investment and cost for implementation and upgradation of MES. The key market players such as Siemens AG (Germany) and Schneider Electric SE (France) are focusing on new product launches and developments, and collaborations strategies to enhance their product offerings and expand their business. Food and beverages manufacturers are dealing with rapid changes in consumer demographics and tastes; government regulations further impact their operations and tracking of products. The manufacturing execution system enhances the plant efficiency and productivity and also provides greater visibility and flexibility throughout the production process. It collaborates with the complete chain of events and equipment involved in the physical production flow that enables timely and accurate decision making. F&B manufacturers implementing MES in their plants to gain technological advancements and develop high-quality products while minimizing production costs. In the oil and gas sector, safety and reliability are crucial. The oil and gas sector has many simultaneous operations that need to be planned, scheduled, executed, and monitored on time. The implementation of MES in the oil and gas sector helps manage production processes efficiently and effectively. There is increasing competition among the manufacturers owing to the need for operational excellence. In the oil and gas sector, manufacturing execution systems facilitate long-term planning and short-term scheduling of operations. The execution of operational instructions, workflows, performance calculation, balancing energy and mass, and checking inventory levels are the functions performed by MES in the oil and gas industry. MES plays a significant role here, leading to the rapid growth of the MES market in this sector. The implementation of MES in aerospace and defense improves the product quality during the production by checking the machine, material, and tool availability. Real-time visibility of the process helps in effective management of the production and increasing the yield. The historical data related to machineries and systems is very important in the aerospace and defense industry. MES provides the data of different parts to meet the specific requirements of military and aerospace for understanding the shelf life of the product. The use of MES also helps analyze the historical data and helps in making improvements and enhance decision making. The data related to different parts and systems is captured using RFID, SCADA, and barcode to eliminate any errors in the data. What are the upcoming industry applications for MES? 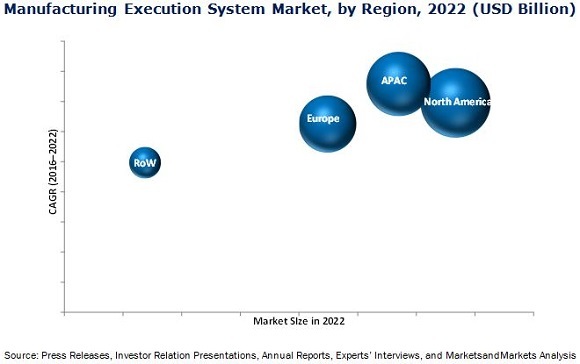 11.2.1.1 Continuous Developments in the Manufacturing Execution System Market in the U.S.